This illusion was invented by Luis de Matos of Portugal and we're pleased to have been chosen to offer it to the magician fraternity. 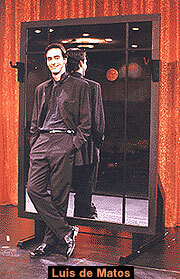 The magician steps behind a large mirror which is on legs, allowing all to see under the mirror. 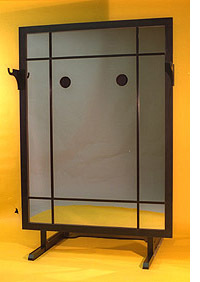 When the magician walks behind it, he is completely hidden, except for his legs, which remain visible under the mirror. There are two holes in the mirror and the magician places his hands through them. He is next handed a rolled-up cloth which he allows to unroll. The cloth is then held up and immediately dropped. The magician has penetrated the mirror and is now standing in front of it. Luis has used this illusion on his television show in Portugal and we are pleased to offer a video of his presentation. The video also provides a look at the construction features of the illusion. When set up, the mirror is quite large, but packs to a convenient size and is supplied with an ATA case which measures 52 1/4" x 39" x 15".